He graduated in Piano with Carmen Romano and Composition with Lucia Ronchetti at the Conservatory of music “G. Martucci” in Salerno with highest honors, and graduated with the highest honors, at the Master’s courses (high improvement in Composition) of Ivan Fedele at the National Santa Cecilia Academy in Rome. composition competition Toru Takemitsu 2009, chairman Helmut Lachenmann (Tokyo -Japan): Kalv/Project Music Lab of Gotheborg (Sweden): FORUM 2010 - MUSIQUE ET VIDÉO D'ART (10th International Forum for Young Composers - NEM, Nouvel Ensemble Moderne). He has followed the masterclass of Salvatore Sciarrino, Brian Ferneyhough, Georges Aperghis, Michael Jarrell, Marco Stroppa, Hugues Doufourt, Yan Maresz, Bruno Mantovani. Orchestre Nationale de Lorraine, Orchestra del Conservatorio “G.Martucci” di Salerno, chamber ensembles like the Neue Vocal Solisten of Stuttgart, Ensemble Algoritmo, Aleph ensemble, Monesis ensemble, Interensemble, soloists like Mario Caroli, Ann Cravero, Amandine Robilliard, Matteo Cesari and directed by prestigious conductors like Zsolt Nagy, Tetsuji Honna, Marco Angius, Jacques Mercier, Flavio Emilio Scogna. Composition and Computer Music 2008/2009, and obtaining the artistic residence at the Citè Internationale des Arts. 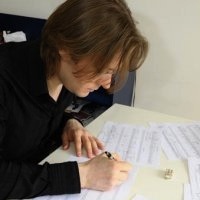 Besides he has been selected by the ensemble Aleph for the V International Forum of Young Composers 2008 (France). He regularly plays piano both as soloist and with various formations, executing musics of classical authors, contemporary, and his compositions (has played in Rome, Milan, Naples, Barcelona (Spain), Wien, Budapest). From September 2008 he will be researcher at the Mèdiathéque Mahler in Paris, developing a project of research thanks to the European Placement on the music of Iannis Xenakis. In June 2008 the POGAS (Office for the juvenile politics and sporting activity), the GAI (Association for the circuit of the Young Italian Artists) and the PARC (general Direction for the architecture and contemporary arts of the Office for the cultural Activities) confers the scholarship MOVIN'UP 2008, to support of his composer activity for the foreign countries. He has recently won the 2nd prize at the Toru Takemitsu International Award (Tokyo - Japan: chairman Helmut Lachenmann), and his symphonic work has been performed by the Tokyo Philarmonic Orchestra. "Reading Session" of The International Summer Course for New Music Darmstadt, and his piece will be perfomed by Ictus & Nadar Ensemble. 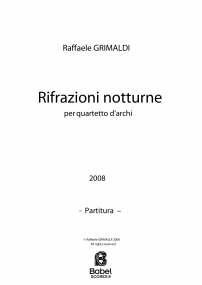 His works are published by Raitrade (Rome - Italy). 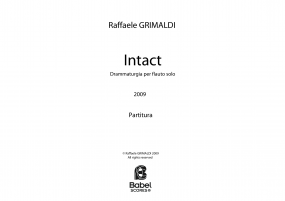 Raffaele Grimaldi actually lives and works in Paris, and is also teacher of Composition at "G. Martucci" Conservatory of Salerno.